The Big Alpha for Evolve came out today and runs through this weekend for those players lucky enough to have gotten a code. What that really amounts to is that people that signed up got the codes, no real criteria other than that. I played around a little with it today, after the Alpha went live at noon eastern, and since it’s my first experience with the game, I thought I’d put down my thoughts on the game. 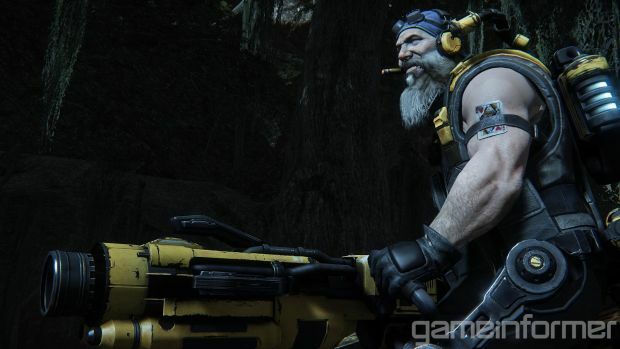 Evolve is the new game from the team behind Left 4 Dead, and as such, there are a lot of similarities. 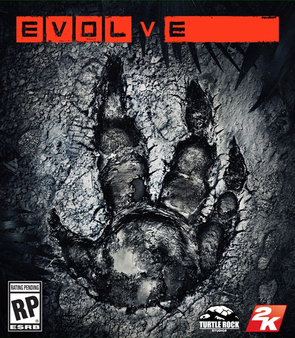 Even though it’s a competitive game, in reality, Evolve is really a co-op game. The four hunters need to work together in order to bring down the Monster, and that really amounts to each hunter playing their role over trying to attack. Support and Medic players need to focus more on helping their team, while the Trapper should absolutely focus on keeping the Monster contained. That will free up the Assault to really pound the Monster with attacks. I’ve gotten some time with the Support class, and I’ve got to say, it’s actually a lot of fun. I’m not usually a huge Support class player – I’m more often the Tank/Nuker – but playing as the Support is a ton of fun. It’s also a really great way to explain how the game works. Each class has four items – assigned to the X, Y, RB, and B buttons on the Xbox One – and each has some degree of cooldown. It’s important to use the right item at the right time – as a Support, you should have the shield generator out most of the time. Once that Monster shows up, that shield will be super important – and using the Cloak is a great way to pull back and heal up after a battle, as well for revives. The other nice thing about Support is that they still have good offense options – there’s their laser cutter, which is their primary, plus they have an Orbital Bombardment, which is awesome to use against the Monster after the Trapper throws down the Mobile Arena. The flow of a game is a really refreshing take on a multiplayer game. The match starts with the Monster roaming free – building up his level by attacking and eating the AI wildlife; and the four Hunters are searching around the arena trying to find him. This is where the Trapper is really important, since they can track down the Monster easier. The AI wildlife is potentially dangerous, but if you move about as a group, you shouldn’t have much trouble. It’s when the Monster is found that the action really kicks off. The Trapper should throw down the Mobile Arena, and then the real combat begins. Medics should be healing whichever character is getting hit, while Support shields whoever the Monster is focusing. The Trapper can cause some debuffs, and Assault should just pound the Monster. From what I’ve been able to tell, it seems like it has to be pretty difficult to play as the Monster. You may have an incredible amount of health, plus multiple abilities to use (that vary depending on which Monster you are) but you are playing against four people. It’s important to pick and choose your targets carefully – in addition to getting a good first hit on them. I would say target the Medic/Support classes first, especially while you’re still trapped in the Arena. Killing them will help mitigate how well the Hunters can survive. Beyond that, I would go after the Assault to help lower the damage you’re taking, then finish off the Trapper. I will say, that’s just my impressions of it after playing as Hunters – I haven’t gotten a chance to play as a Monster yet. All in all, even though this is just an Alpha, so there’s still a lot of content we don’t have; but the game is a really fun experience. I can really see why it picked up pretty much every award ever at E3 this year. It’s a really unique, fresh experience in the Shooter world, which is needed with how strong the market is this year. With another Beta coming to Xbox One in January before the February launch, Turtle Rock has plenty of time to flesh out the final experience. This entry was posted in Uncategorized and tagged Big Alpha, Evolve, Evolve Big Alpha, Impressions, Video Games by Dan Fasulo. Bookmark the permalink.